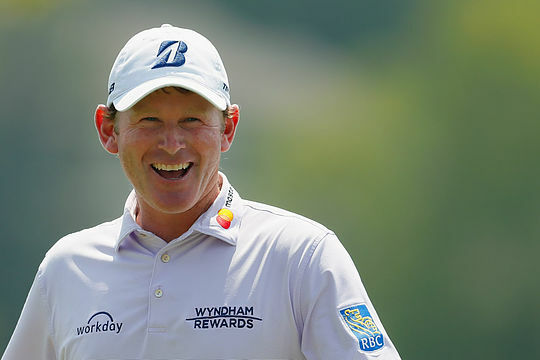 American Brandt Snedeker sensationally holed a 20-foot closing hole birdie to join one of the more exclusive clubs in golf in posting a sizzling 11-under 59 on day one of the Wyndham Championship in Greensboro, North Carolina. Snedeker, 37, commenced his round with a 10th hole bogey and then cut a swathe through the field with an eagle and 10 birdies from his fourth to 16th holes. But the eight-time Tour winner, who captured his maiden Tour title at the 2007 Wyndham Championship at Forest Oaks, nervously missed a birdie putt from six feet at his 17th before the excitement of seeing his 59th shot in the $6m event drop at the last. One of Snedeker’s historic-making shots included ‘slam-dunking’ his second shot for an eagle at the uphill par-4 sixth hole that he was playing as his 15th. Snedeker’s 176 yard shot severely damaged the hole and officials took the unusual step of cutting a new one a couple of feet away. Fellow Americans – Ryan Moore and John Oda – share second place with rounds of 63. Masters winner, Sergio Garcia was the leading European in a 12-way tie for 20th place after birdieing four of his closing nine holes in a round of 66. USA Ryder Cup captain, Jim Furyk holds the all-time Tour low of a 58 on the final day of the 2016 Travelers Championship while Furyk has also shot a 59.